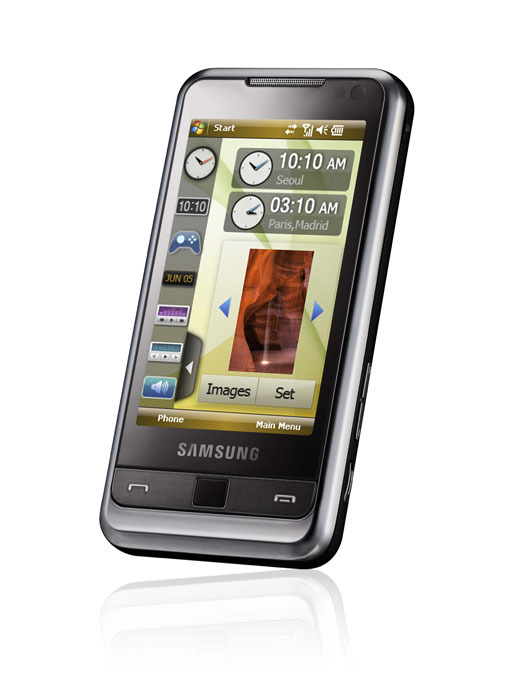 Samsung SGH-i900 Omnia was recently reviewed by the::Unwired. It is a cool phone based on Window Mobile 6.1 Professional with haptic touch. Samsung has done a fantastic job of making an operating system that is designed to work with a stylus to respond to touch. The screen is 3.2″ in size and supports 240 x 400 pixel (WQVGA). It comes with 3 customized Today screens and an accelerometer. features quadband GSM/GPRS/EDGE but only singelband UMTS at 2100 MHz and HSDPA (up to 7.2 Mbps) while HSUPA isn’t supported. Furthermore, the SGH-i900 features Bluetooth 2.0+EDR including support of A2DP as well as WiFi b/g, inbuilt GPSand FM radio with RDS support. The phone has 5 Mpxl camera, and meagre 128MB RAM. However, Omnia comes in two models with 8GB or 16GB interal flash storage and both models support microSD cards with upto 16GB memory. The Omnia comes with all the standard Windows software. In addition, Samsung has included Opera Mobile 9.5, ShoZu, a RSS reader and Podcast fetcher as well as a business card scanner software, a FM radio interface and more. The Omnia comes with a good music player and video support including Divx support. You can watch Divx movies on TV through the onboard TV connectivity.